Cathy is our hostess for Mo's Challenge this week, and she would like us to use flowers on our creations. You can use ready-made flowers or make your own! I chose to make the flowers for my card. I used an assortment of punches and dies to make the daisies, roses, cornflowers, and tiny scattered blossoms and leaves. I love "Baby With Bunny" so I've used it again this week! Images: "Baby With Bunny" from Mo's Digital Pencil, Stamped sentiment from SU! Please join us this week for a chance to win a $5.00 gift certificate to Mo's Digital Pencil. We're also still looking for two Guest Designers to serve on our team for three months! Check out all the details on Mo's Challenge Blog. 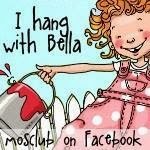 This is adorable Elaine, what a cutie Mo created here :0) and love your layout. Like your 5x7 style, makes a pleasant change, I am stuck in a square rut...must dig myself out. Gorgeous card, i love that image too. Love your home made flowers they look gorgeous. You did such a fantastic job with the flowers on this card Elaine. I love all the different shapes and the layering. Super sweet! Hugs! Great job with the punched flowers. I forget I have those... maybe it's time to dust them off and put them to use again. They look so lovely on your card. Just adorable Elaine! Love the flourishes around the frame and the flowers are wonderful! I love all those punched flowers, Elaine! They are a beautiful frame for this cute image and perfect for Cathy's challenge! Gorgeous work!